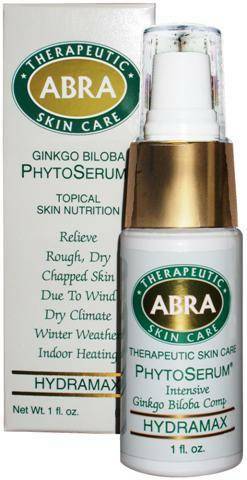 Gingko Biloba Phytoserum An intensive high potency moisture restorative serum for parched, rough, chapped and severely dehydrated skin due to over exposure to extreme weather conditions and environmental dehydration. Our synergistic concentration of actively therapeutic standardized herbal extracts and rich emollient oils help replenish vital moisture and nutrients to severely dehydrated skin. Formulated with 2% standardized time released Phytoliposomes of ginkgo Biloba and supported by an organic 30% whole herb concentrate of chamomile, mallow and ginkgo Biloba, with emollient oils of jojoba, Kukui nut, avocado seed and macadamia nut and essential oils of ylang ylang and rose geranium in an organic aloe vera serum.